Richard “Rick” Anthony Johnson, 62, passed away on Tuesday, Jan. 1, 2019. He was born on Oct. 25, 1956 in Eau Claire, Wisconsin. Rick is survived by the love of his life, Theresa Johnson and will be lovingly remembered by his daughters, Brandie (Thomas) Trimble, Noelle (Jeff) Simpson and Katy Johnson; grandchildren, Eden, Colton, Beckham and Blake. He was preceded in death by his parents, Harvey and Elaine Johnson and siblings, Jim Johnson and Cherie Bishoff. Rick loved Jesus, his family all being together, the outdoors and football. Expressions of condolence at www.wellsmemorial.com. Haleigh Jump, 12, of Plant City, born on April 14, 2006 in Tampa, entered into her eternal home on Jan. 1, 2019. Mildred Miller “MawMaw”, 85, of Lithia, born in Walton County, Georgia on Oct. 15, 1933, entered into eternal rest on Jan. 2, 2019. 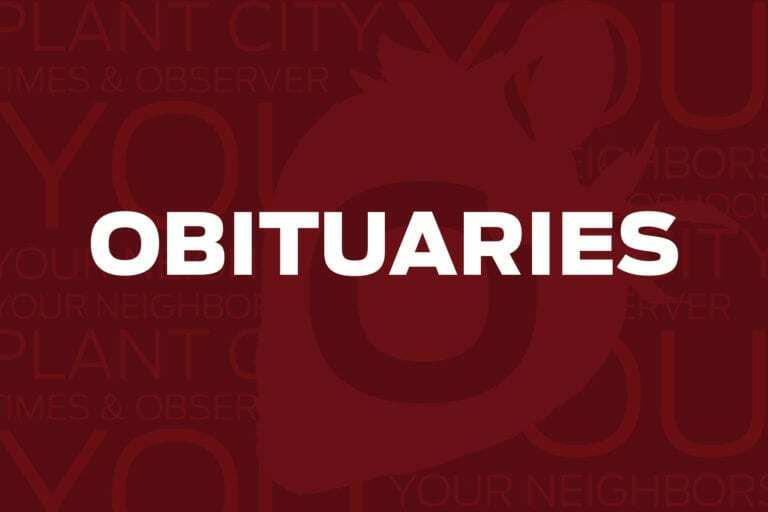 Charles R. Adams, 75, of Plant City, and formerly High Point, North Carolina, entered into eternal rest on Jan. 3, 2019. Dorothy “Dot” Ann Provau Neal Harrelson, 77, of Plant City, born in Plant City on May 11, 1941, entered into eternal rest on Jan. 1, 2019. Gene Edward Newman, 79, of Dover, born in Lumber City, Georgia on Jan. 18, 1939, entered into eternal rest on Jan. 4, 2019. Jeanette Hawkins, 79, of Lakeland, passed away on Jan. 7, 2019. The family will receive friends Thursday, Jan. 10 from 1:30 p.m. to 2:00 p.m. at Haught Funeral Home, 708 W Dr. MLK Jr. Blvd., Plant City. A graveside service will follow at 2:30 p.m.
Margaret Apgar, 81, of Dover, passed away on Friday, Jan. 4, 2019. Funeral Services will be held at 4:00 p.m., Thursday, Jan. 10 at Wells Memorial, 1903 W Reynolds St, Plant City. Visitation will be held two hours prior, from 2:00 p.m. to 4:00 p.m. at the funeral home. Expressions of condolence at wellsmemorial.com.